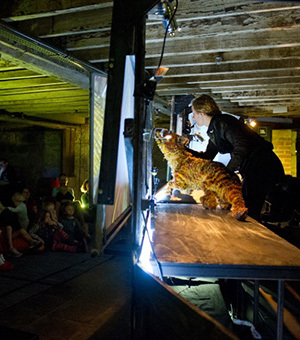 The Dream of the Thylacine is a performance based on the illustrated children’s storybook by Ron Brooks and Margaret Wild. Created by acclaimed, Sydney-based company, Erth Visual & Physical Inc., this family theatre show brings to life lost memories of the world’s last Tasmanian tiger. Incorporating myth and fact with incredibly life-like puppets, the show tells the story of what might have been the Thylacine’s last dream; roaming the wilderness longing for freedom. When preparing the show, Artistic Director Scott Wright interviewed many local Tasmanians and held public forums in Hobart and Launceston at which people shared their stories of sightings, experiences and myths. Some of these interviews feature in the show. The Dream of the Thylacine premiered in Hobart at Ten Days on the Island Festival with a season at the Tasmanian Museum & Art Gallery in Hobart and another at the Queen Victoria Museum & Art Gallery Launceston. Forums were held in both cities at which artists involved with the show interacted with zoologists, biologists, conservationists and the public. Rankin has also praised the simple and sparse aesthetic of the show and the way it ‘… creates a dreamlike and intimate portrait of a creature alone in her element, in a world she has known forever, but that we know will not last. The Sydney season of The Dream of the Thylacine will run from 25 September to 5 October at Carriageworks.